In 2008, Cedric was brought to the Medina Raptor Center as an orphan. We nourished him and kept him through the winter. Unfortunately, Cedric had an injury of his wing which would not allow him to fly normally. We worked with the veterinarians to see if the wing would heal properly. Cedric was deemed unreleaseable. 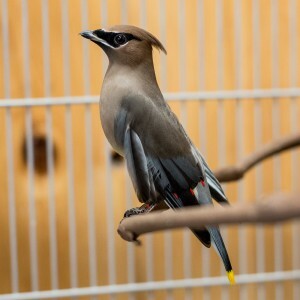 Cedric has served as a foster parent to many cedar waxwings that have been orphaned. He has taught them to eat on their own. The Cedar Waxwing is a smooth, almost silky looking bird that searches for insects in the summer and forages for berries in the winter. Mainly fruits such as serviceberry, strawberry, mulberry, dogwood year-round. In the winter they will eat cedar berries mistletoe, honeysuckle, hawthorn. In the summer they will also have a protein-rich diet of insects such as dragonflies and mayflies. Resides in deciduous, coniferous and mixed-forest woodlands with a preference toward areas with streams. They will congregate toward areas that have fruiting plants and trees, which are often found in gardens, parks and open woodlands. Feed while perched, but will sometimes pluck berries in flight. A nest of small twigs, blossoms, string and cattail down that is approximately 5 inches across. The inside will be lined with grasses, pine needs and small, fine roots. Altricial, naked, blind and weak with eyes closed. They are very quiet.